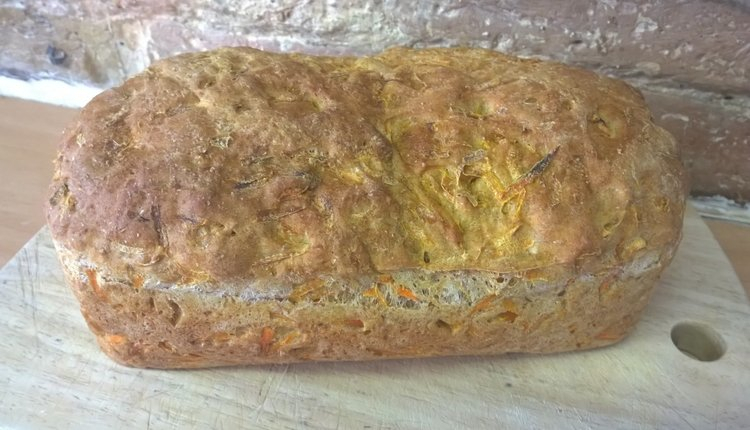 You’ve had carrot cake, but have you had carrot bread? If not, then why not give it a try? It’s a lovely moist loaf, full of veggie goodness (apologies to the many people who hate the word “moist” but I’ve yet to find another word that does quite the same job). 1. Combine the flour, sugar, salt, water, yeast, sugar and olive oil into a dough. 2. Knead on a lightly oiled surface for about 10 minutes until smooth and elastic. 3. Place in a lightly oiled bowl covered with cling film or a dish towel, and prove in a warm place for one and a half hours. 4. Turn the dough out onto a floured surface and knead in the grated carrots, it’s quite tricky to get them to all stay in the dough and you’ll probably need to work in some extra flour because of the wetness of the carrots (When I did the courgette/zucchini version, I needed quite a bit more extra flour than the carrot version, but it will clearly depend on how much water comes out of the veg you’re using. The loaf will be quite sticky, that’s ok, but dripping wet isn’t!). 5. Place the dough into a large loaf tin and prove it again for about an hour. 6. Place in a preheated oven 200C/400F for about 35 mins. It will be hollow when tapped if it’s done. Cool on a rack. The loaf has lovely orange flecks in it when you cut it into slices, I would show you but the one and only photo I took of the inside is blurry! I like this bread simply sliced and spread with butter. Cool concept. Did you come up with the idea or had you eaten carrot bread in the past? Vanessa what does ‘strong’ flour mean. Not a term we see in recipes here, or that I have seen. You probably just call it ‘bread flour’? I’m not sure why we include the word ‘strong’ in there, other than that we can also get ‘extra strong’. I used to think the word ‘strong’ related to the taste, like it had a strong wheat taste maybe that was good for bread, but I guess it must relate to the physical elastic strength created by the extra gluten – I’m curious myself now if that’s what the ‘strong’ relates to, I shall look it up! Ah ha, I’m not the only one who isn’t familiar with the term “strong flour!” Here in the States we have regular flours (white, whole wheat, rye, and the like) and also some called bread flours, which include some leavening ingredients. I’m curious to know what you find on the subject! I’ve just done a post about it! It’s the gluten content that makes bread flour different than regular flour. Me too, never heard of “strong flour” before. I like the idea of carrot bread. I bet it’s tasty! I’ve just done a post explaining all about flour 🙂 Yes, I wanted to capture some of the niceness of carrot cake but without all the sugar!